Abderrahim Boudenne is an assistant professor at Paris XII University (France). Professor Boudenne received his PhD from Paris XII University. Until 2006 he held positions in the CERTES Laboratory of Paris XII University and previously he worked in the LPP laboratory at the Tlemcen University (Algeria). His main research interests have included manufacturing of polymers and polymers composite materials and the investigation of the thermophysical behavior of polymers and composite materials, and new methods for the measurement of thermophysical properties and characterization of defects in composites. Laurent Ibos is assistant professor in CERTES, IUT de Créteil Université Paris XII. He received his PhD at Paul Sabatier University, Toulouse (France). Professor Ibos’ present position in the Thermal Science Laboratory of CERTES involves the investigation of the thermophysical behavior of polymer composite materials, development of experimental methods for the measurement of properties of composites and testing of composites. He is also has a position at the Institute of Technology, Paris XII University teaching materials science, vacuum technology and instrumentation. Yves Candau is a professor in CERTES and he is also head of this group. The centre's research work includes IR thermography, materials and their proprieties, modeling, and aerosols. Sabu Thomas is Professor of Polymer Science and Engineering in the School of Chemical Sciences at Mahatma Gandhi University (India). He received his PhD from the Indian Institute of Technology, Kharagpur (India). He has had many postdoctoral and visiting professorships as well as industrial and academic/teaching positions. The research group of Professor Thomas has received 22 national awards for work in polymer science/engineering. His major fields of interest include blends, composites, interpenetrating polymer systems, reuse of plastics and rubbers. 1 Physical, Thermophysical and Interfacial Properties of Multiphase Polymer Systems: State of the Art, New Challenges and Opportunities. 1.3 A short survey of the literature and applications. 1.5 Future outlook, new challenges and opportunities. 2 Macro, Micro and Nano Mechanics of Multiphase Polymer Systems. 3 Theory and Simulation of Multiphase Polymer Systems. 3.2 Basic concepts of polymer theory. 3.3 Theory of multiphase polymer mixtures. 3.4 Simulations of multiphase polymer systems. 4 Interfaces in Multiphase Polymer Systems. 4.3 Characteristics of interfacial layers. 4.4 Interface modifications: Types and aims. 4.6 Methods of interface analysis. 5 Manufacturing of Multiphase Polymeric Systems. 5.2 Manufacturing techniques of polymer blends. 5.3 Manufacturing techniques of polymer composites. 5.4 Manufacturing techniques of nanocomposites. 5.5 Manufacturing techniques of polymer gels. 5.6 Manufacturing techniques of interpenetrating polymer networks (IPNs). 5.7 Conclusion and future outlook. 6 Macro, Micro and Nanostructred Morphologies of Multiphase Polymer Systems. 6.2 Morphology development mechanisms of multphase polymer systems during processing. 6.3 Material-relevant factors affecting the morphology. 6.4 Processing relevant factors affecting the morphology. 7 Mechanical and Viscoelastic Characterization of Multiphase Polymer Systems. 7.3 Interpenetrating polymer networks (IPNs). 7.6 Conclusion, future trends and challenges. 8 Rheology and Viscoelasticity of Multiphase Polymer Systems: blends and block copolymers. 8.2 Morphology of polymer blends. 8.3 Microrheology of droplet deformation. 8.4 Rheology of polymer blends. 8.5 Microphase separated block copolymers. 8.6 Dynamic viscoelastic results of SEBS copolymers. 8.8 Capillary extrusion rheometry results of block copolymers. 9 Thermal Analysis of Multiphase Polymer Systems. 9.4 Temperature modulated differential scanning calorimetry. 9.5 Micro- and nanothermal analysis. 9.6 Thermal gravimetric analysis and evolved gas analysis. 10 Thermophysical Properties of Multiphase Polymer Systems. 10.2 Thermophysical properties: Short definitions. 10.4 Thermophysical properties of polymers and composite systems. 11 Electrically Conductive Polymeric Composites and Nanocomposites. 11.4 Effect of processing conditions on the electrical behavior of composites. 12 Dielectric Spectroscopy and Thermally Stimulated Depolarization Current Analysis of Multiphase Polymer Systems. 12.3 Copolymers and interpenetrating polymer networks based on Poly(alkyl acrylate)s and Poly(alkyl methacrylate)s (mixing and phase separation). 12.4 Rubber/silica nanocomposites (interfacial phenomena). 12.5 Polymer nanocomposites with conductive carbon inclusions (percolation phenomena). 13 Solid-state NMR spectroscopy of Multiphase Polymer Systems. 13.2 Phases in polymers: Polymer conformation. 13.3 High resolution 13C NMR spectroscopy of solid polymers. 14 ESR Spectroscopy of Multiphase Polymer Systems. 14.10 Other polymer multiphase systems. 15 XPS Studies of Multiphase Polymer Systems. 15.2 Basic principles of X-ray photoelectron spectroscopy. 15.3 Applications of XPS to polymeric materials. 16 Light Scattering Studies of Multiphase Polymer Systems. 16.3 Phase behavior of multiphase polymer systems studied by SALS. 16.4 On-line morphological characterization of polymer blends. 16.5 Light scattering characterization of other multiphase polymer systems. 17 X-ray Scattering Studies on Multiphase Polymer Systems. 17.3 Studies on multiphase polymer systems. 18 Characterization of Multiphase Systems by Neutron Scattering. 18.2 Method of neutron scattering. 19 Gas Diffusion in Multiphase Polymer Systems. 19.2 Gas transport mechanisms in dense polymer films: Definition of the transport parameters. 19.3 Multiphase polymer systems for improved barrier properties. 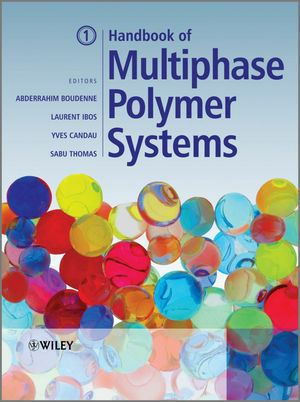 19.4 Multiphase polymer-based systems for improved selectivity. 20 Nondestructive Testing of Composite Materials. 20.2 Failure mechanisms in polymer composites. 20.10 Optical deformation and strain measurement system. 21 Ageing and Degradation of Multiphase Polymer Systems. 21.4 Impact of multiphase structure on ageing processes. 21.5 Practical impact of physical ageing on use properties. 22 Fire Retardancy of Multiphase Polymer Systems. 22.2 Combustion and flame retardancy of polymers. 22.5 Synergistic effects of fillers with flame retardant additives. 23 Applications of Selected Multiphase Systems. 23.3 Aeronautics and spacecraft applications. 23.5 Electrical and electronic applications. 24 Waste Management, Recycling and Regeneration of Filled Polymers. 24.6 Mechanical recycling of filled thermoplastics. 24.7 Waste management of glass fiber-reinforced thermoset plastics. 25 Nanoparticle Reinforcement of Elastomers and Some Other Types of Polymers. 25.3 Nanoparticles in glassy polymers. 25.4 Nanoparticles in partially-crystalline polymers. 25.5 Nanoparticles in naturally-occurring polymers. 25.6 Nanoparticles in relatively-rigid polymers. 25.7 Nanoparticles in thermoset polymers.